The best non-comic dude of the 80's? Freddy Krueger. I loved the first two Nightmare on Elm Street movies in a way that the surgeon general would never deem healthy, so in compiling this week's cosplay best, I threw a Freddy in. Just like Where's Wally? (or Where's Waldo? if you are in the US / Canada) see if you can find him. Storm here looks like she's about to unleash all types of lightning and.. well... storms, and I know just how she feels. If I hear one more Christmas Carol in 'mall surround sound', I'm going to hurt someone to. The problem I think that stops a lot of folk from cosplaying as Hawkman or Hawkgirl, is the wings. Instantly, if you can find a pair, they generally make your costume look a bit naff, before you even start on the mask. 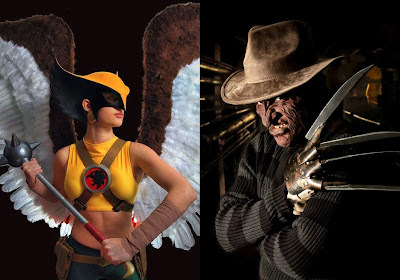 One winged wonder who broke the curse is cosplayer Kira Kouture - here she looks ready to take on the armies of the Rann, with or without Hawkman! Okay so you found him. Norwegian cosplayer Kim San may spend more time as Jack Sparrow than Freddy, but with claws like those a change in persona would be strongly recommended. All he needs is those haunting skipping girls to walk three blocks ahead of him singing, and this guy would have it sorted. 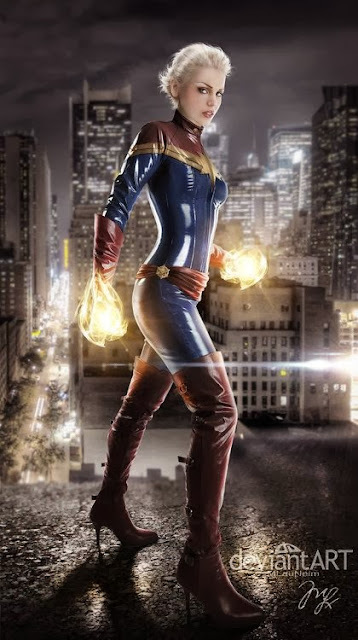 I like my Carol Danvers in the classic Ms Marvel 'thigh high boots and red sash' version and with long hair that would put Beyonce to shame, but if anything was going to make me change my mind on her recent transformation into Captain Marvel, it would be this shot by Maryneim. Ok so Loki isn't the only one who plays tricks - this is actually digital art, not a cosplay at all, but I felt this was the best way to highlight Maryneim's incredible skills. Face it, even though you now know the picture above isn't a photo, do you still believe it? 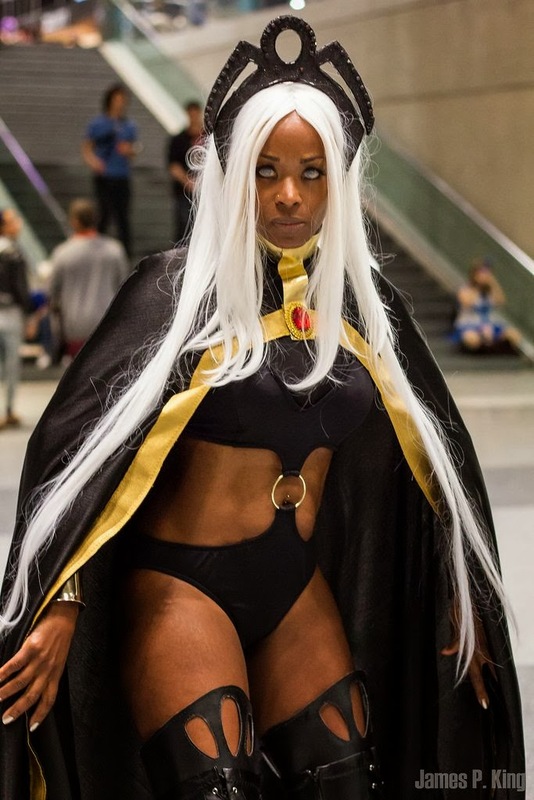 that Storm and Hawkgirl are pretty neck n neck but i might have to give the edge to the Storm cosplay for willing to put in those contact lenses. assuming that's not photoshop that is. Thanks Dave - I give it to Storm just for the attitude. The face really has the fierceness I associate with the character and makes the costume work. The Hawkgirl cosplay looks a bit like a toy figure to me, too clean. The prize for me tho has to go to the Ms. Marvel player - very good indeed! My fave Ms Marvel cossie has to be her original, the famle variant on Captain Mar-vell's old duds, the one with the red sash and the bare midriff [which Marvel Comics had to cover up in later issues as it was considered too racy]. I liked the long black boots on her second costume but not the overall scheme of it, tho it did mark out her independence as a superhero from her naescant Kree origins. Hard to think that was considered too racy now huh Karl, especially considering what Madalyne Prior, Psylocke, Emma Frost and Shanna She-Devil run around in! I love the Captain Marvel outfit. More like a uniform and space-ready. She doesn't need to show it all to get respect anymore. Hey Kal - that's true - it's a bit of a change from the bad girl era of the 90's huh? Thanks a lot for the feature! :D -Kim-san. Thanks for dropping a few words in and stopping by Kim-San! You do great work!